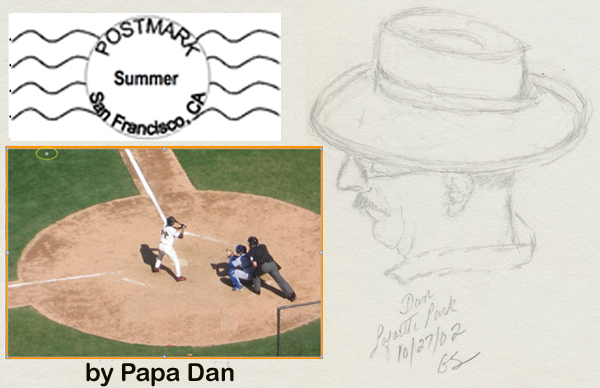 Friday, June 24th, 2011, by Daniel and is filed under "Baseball, Family Stories, Who We Are ". You can leave a response here. Pinging is currently not allowed. Dan, It is good to see you are allowing us to read your musings again. Baseball, to me, was freedom. Not playing, but listening to Vin Scully on the radio at night in the dark in bed, or taking the bus all the way from Palos Verdes into Dodger Stadium via the Los Angeles bus terminal. Truly an escape and an adventure. For me, I loved it as much as you, for the roll it played and the opportunity for personal growth. I agree with your appreciation of both baseball and Vin Scully. Believe it or not, back in the day, I had a radio that allowed me to listen to KFI in LA, so I got to hear Vin Scully and Jerry Doggett broadcast the Dodger games. Unfortunately, I have to tell you that I felt (and feel) the same way about the Dodgers as you feel about arugula!